Former Derry City and Coleraine midfielder Ruaidhrí Higgins has decided to hang up his boots and link up with an old boss. The 32-year-old, who will be joining Stephen Kenny’s backroom team at Dundalk as an opposition analyst taking over from Gerry Spain, admitted that after thinking long and hard about it, he believes retiring and working behind the scenes with the League of Ireland Premier Division champions was too good an offer to turn down. 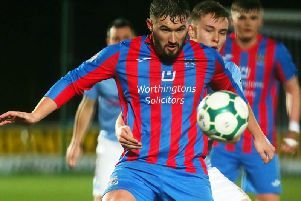 “I’m content and obviously I have had a good few weeks now to think about it since I left Coleraine, I felt it was time to do something different,” he said. “I had a couple of offers to continue playing but I spoke to my wife and family and weighed everything up and the bottom line was if you have any doubts about wanting to keep playing, then I think it’s time to stop. “I was having doubts and was thinking that if I sign for a new club and things don’t start well I would regret it, so basically I just thought it was time for something different. The Limavady man, who won a host of FAI and League Cup winners medals during his career, also played his part in the Oriel Park men’s title success in 2014. In total he won 10 honours during his senior career which saw him play for City, Bohemians, Dundalk and Coleraine. Yet the play making midfielder, who wasn’t always appreciated by supporters, played like a ‘quarter-back’ at times spraying defence splitting passes from the middle of the field. And in his new job at Dundalk he will have to bring that intelligence with him as he looks to keep Stephen Kenny’s side on the winning run, both domestically and in Europe. “I will be doing opposition analyst stuff with a bit of coaching involved at Dundalk,” he added. “I played with some unbelievable players and under a couple of very good managers . . . .I’m delighted to be going into this type of role at Dundalk, because it’s the side of the game I love. “It’s a great opportunity and one that I couldn’t turn down. Working with Stephen (Kenny) again is hard to turn down. “What has been going on at the club has been phenomenal over the last few years. I was a part of it at the start and obviously it’s great to have that option to go back, all be it in a different role, but it’s one that I’m really looking forward to and hopefully I can contribute to it in a positive manner. “I also have been offered a full-time job, so my role at Dundalk will be part-time but a very busy part-time role,” he joked. Higgins has played with the likes of Paddy McCourt, Danny Lafferty, James McClean, Niall McGinn and Mark Farren at the Brandywell before playing with top talents at Dundalk such as Stephen O’Donnell, Andy Boyle and Daryl Horgan to name but three and believes he has been fortunate in his playing career. “I have been fortunate enough to be part of a lot of good teams,” he added. “I enjoyed quite a bit of success, obviously won the league and a load of league cups and a couple of FAI Cups. It went well and I have a lot of good memories. “I played with some unbelievable players and under a couple of very good managers and I feel I have learned a lot from people over the years and I’m delighted to be going into this type of role at Dundalk, because it’s the side of the game I love.